jboss.org JIRA server running at https://issues.jboss.org provides streamlined functionality of "Start Progress" action now, which is in align with latest JIRA default workflow. You had to manually assign issue to yourself to be able to perform "Start Progress" action before this change. Now, the "Start Progress" action is available to all Assignable users (potential developers). Status of the issue is changed and you are made issue's Assignee once you use it, so one less click is necessary and workflow is more user friendly. 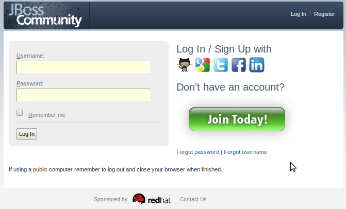 We're proud to announce new feature 'Social Log In and Sign Up' for jboss.org website released few days ago. It allows you to use your Google, GitHub, LinkedIn, Facebook and/or Twitter account to create a new jboss.org user account. You can also link these accounts to your existing jboss.org account. 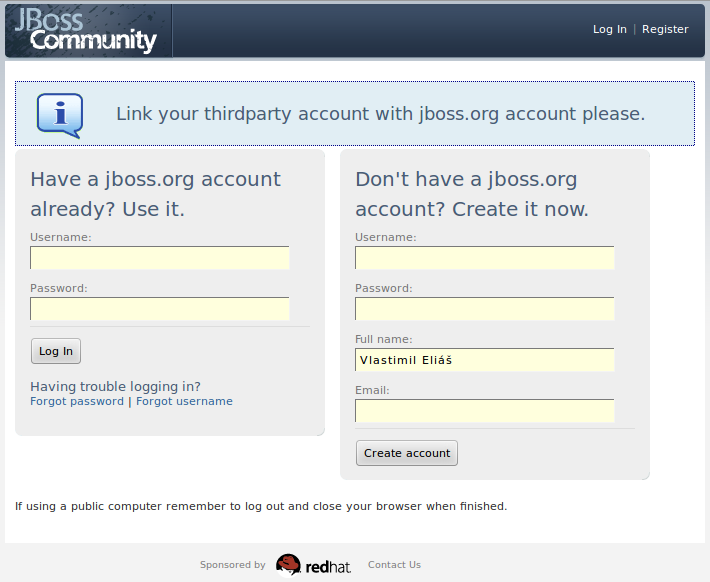 The linking allows you to login to jboss.org website later without entering other password if you are logged in on Google for example. You can simply resolve "I forgot jboss.org password" cases also, by logging in over linked account and changing jboss.org password then. 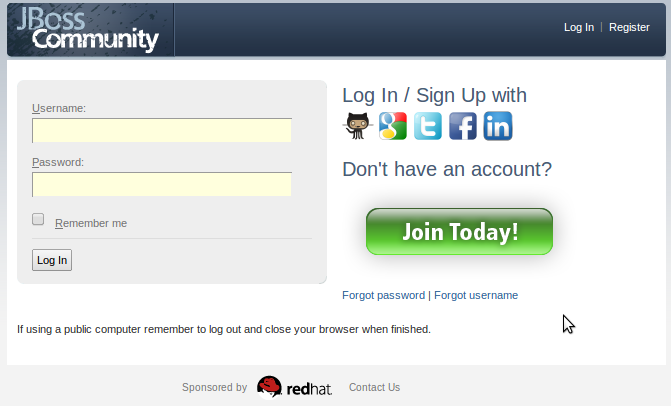 You can find Social provider icons directly on jboss.org login page and use them for Log In or Sign Up. 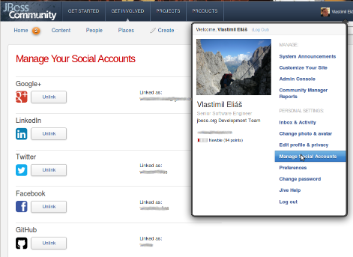 If social account is not linked with any jboss.org account yet, you can do that via next screen allowing you to link it with your existing jboss.org account or create a new one. Registration form is prefilled by name and email obtained from your social account to save your work a bit. Later you can manage your Social accounts links from jboss.org user profile page. Based on statistics this new feature is very useful since aprox. 30% of newly created jboss.org user accounts are created over it now. Google provider is the most popular one, making over three quarters of all uses. Facebook provider is second well ahead of other providers. "comment by email" feature has been enabled for jira running at issues.jboss.org during today's outage. It means you can reply to a notification email received from jira, and your text will be added as comment for the issue received email was about. "Add a comment from the non quoted email body" handler is used. This message handler creates a comment, but only uses the 'non quoted' lines of the body of the email message. A quoted line is any line that starts with a '>' or '|' symbol and such lines of text will not be added to the comment. The issue to which the comment is added is chosen from the first issue key found in the email subject. The author of the comment is taken from the address of the email message's From: field. Messages from unknown email addresses are ignored silently. You have to upgrade your "from JIRA" email filters if they depend on it. 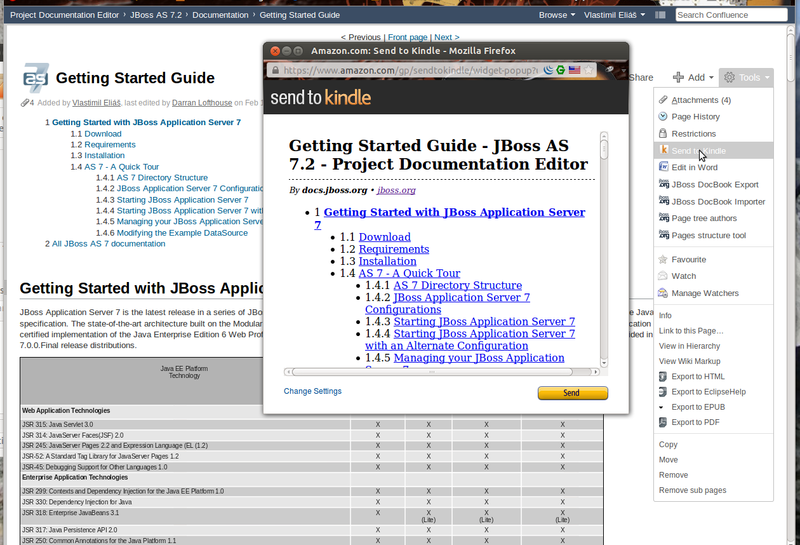 now you can send documentation pages from Confluence running at https://docs.jboss.org/author to your Amazon Kindle reader. This feature was introduced over new Confluence to Kindle plugin. during jboss.org JIRA outage last week we introduced new plugin called JIRA DVCS Connector for Bitbucket and GitHub. This plugin allows to directly show commits from Github repositories on JIRA issue page, with links pointing back to the Github directly. So it's not necessary to use FishEye at source.jboss.org anymore for this kind of functionality. 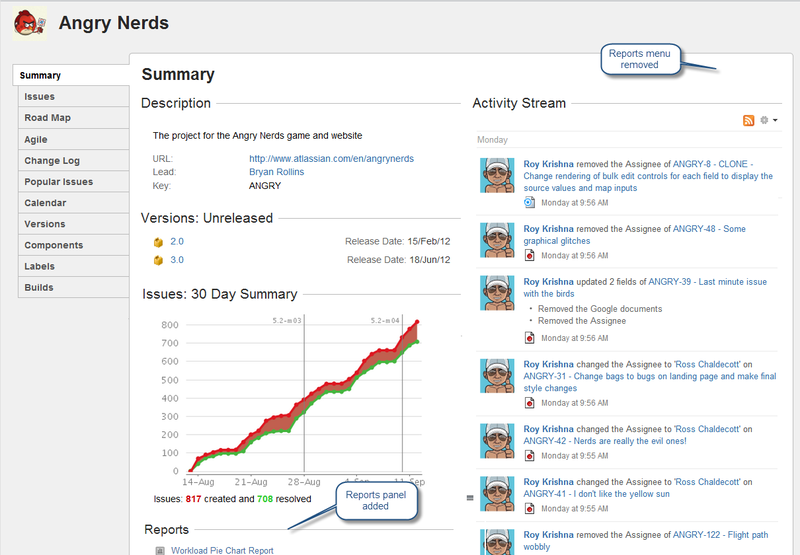 New "Commits" tab is shown on issue detail page. It contains informations about GitHub commits with key of the issue mentioned in the commit message. Plugin allows JIRA issue transitions directly from a Github commit message also. 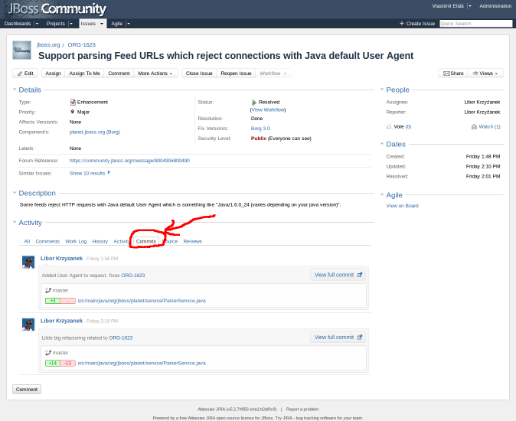 JIRA DVCS connector plugin uses Github web hooks to propagate commits into JIRA immediatelly, which brings small restriction into process of connection. jboss-jira-hook github user must be added into the organization's Owners group. Jira needs this to add webhooks. then you have to send email to help@jboss.org and ask jira administrators to add repository into JIRA DVCS configuration. You have to specify which Github repositories do you want to add (all owned by some Organization, or few named only), and if you want to allow automatic JIRA issue transitions from a Github commit messages. jboss.org JIRA instance has been updated last Thursday to bring you latest version of JIRA and GreenHopper, as you can see in release notes. JIRA upgrade from 5.2.5 to 5.2.7 brings mainly few bugfixes, no any significant change for users was introduced here. You can find links to complete release notes for all new versions in ORG-1616. Two new plugins was introduced also. Separate blogpost will be published for both of them later to introduce what they bring for users. a few weeks ago we configured jboss.org JIRA instance (issues.jboss.org) to allow remote linking of issues with Hibernate JIRA (hibernate.onjira.com) and Apache JIRA (issues.apache.org/jira). This feature allows better linking of issues with upstream/downstream project issues. Linking with Hibernate JIRA is bidirectional, so you can link from Hibernate JIRA issues to jboss.org issues too. 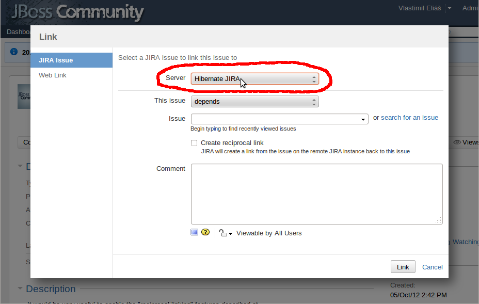 Linking with Apache jira is possible from jboss.org JIRA only, linking is not configured on Apache jira side. 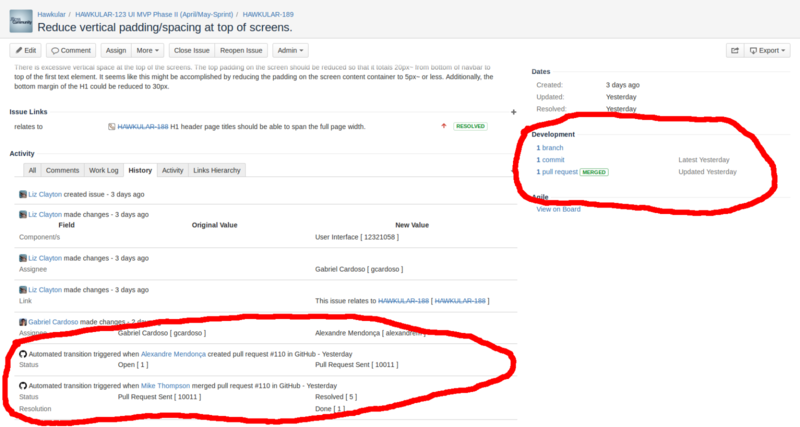 The feature is available from common jira issue Link action. Linking dialog now contains new field called "Server", where you can specify JIRA server you want to link issue from. Then you can directly type in issue key from selected server, or search issue against the server. 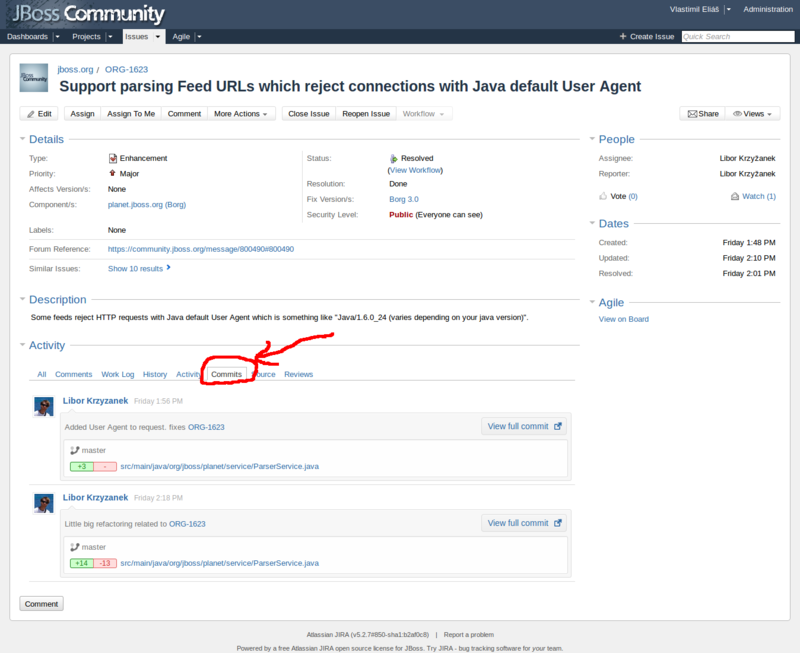 Details about JIRA remote issue linking are available in JIRA documentation. jboss.org JIRA instance has been updated this Wednesday to bring latest version of JIRA and other installed plugins and some bugfixes as you can see in release notes. JIRA point upgrade from 5.2 to 5.2.5 brings mainly bugfixes and performance improvements. One noticeable change is move of reports from dropdown menu to the panel on the Project Summary page, so they are more accessible now. GreenHopper has been upgraded from 6.0.8 to 6.1.1 which brings few new features and enhancements. Main enhancement is introduction of Epics, which provide you with an additional hierarchy of story management, providing planning guidance for groups of issues within, or across, projects. For details see 6.1 and 6.1.1 release notes. Balsamiq Mockups plugin for JIRA has been upgraded from 2.2.2 to 2.2.4 which brings support for linking to web addresses (URL's) in all controls that support linking and other improvements and fixes. See relese notes for full list of changes. new integration point for JBoss Community systems is here as I promised last week. It's based on feature request ORG-1560 and allows you to display build results from Jenkins instance running at the hudson.jboss.org on the issues.jboss.org hosted JIRA dashboard or on some pages of community.jboss.org. If you want to display build status on jira dashboard, simply login to JIRA and display your dashboard (you have to create your personal dashboard if not created one yet and use only default dashboard). Then use "Add Gadget" button at top right, select "Other" group in "Gadget directory", and use "Add now" button for "Build Status" gadget. Then you can close "Gadget directory" and configure gadget on dashboard to show selected build. Use small arrow button on top right of gadget window to open menu, and use "Edit" item here. Then you can put name of selected jenkins job into provided input field and "Save" it. Page is reloaded and voila, build status for selected job is shown here. Color around Job title is changing depending on status of last builds to provide you quick visual information. It can be green, yellow or red. Job title acts as link to the job page in Jenkins server. And there are links to the latest, latest successful and latest stable builds of given Job too. If you want to monitor more jobs simply add other "Biuld Status" gadgets into Dashboard. Very similar process can be used to display build status in some pages of community.jboss.org system. It can be used on all pages with configurable layout as is Personal dashboard, Space main page, Group main page etc. Build status displaying is based on Google Gadget technology, so in reality it can be used in each system/container supporting this technology. Gadget is hosted as plugin in JIRA, and uses Jenkins REST API to obtain build status information to be displayed. If you want to use this gadget in another gadget container system, you can find URL to the Gadget definition xml file on JIRA "Gadget directory" page, it's https://issues.jboss.org/rest/gadgets/1.0/g/org.jboss.jira.plugin.build-gadgets:build-status-gadget/gadget.xml . this week we performed upgrade of JIRA instance running at issues.jboss.org to fix some bugs and bring you few new features. We also continue to improve our community members experience, productivity and collaboration by better integration of distinct systems. Latest addition to this topic on JIRA side is automatick linking to the RedHat bugzilla, based on ORG-1098 feature request. Simly if you use something like BZ-12345 or BZ#12345 or Bug 12345 in JIRA issue descriptions, comments etc. it's automatically rendered as link pointing to the bug in RedHat bugzilla. This minor JIRA update patches few problems as you can see in Release Notes. Probably most noticeable for common user is better handling of text selection in fields on issue detail page, which do not force inline editing anymore. Visual indicators for distinct types of board. as you probably noticed, jboss.org JIRA instance running at http://issues.jboss.org has been upgraded today to JIRA 5.1 and GreenHopper 6.0.
as you probably noticed, jboss.org JIRA instance running at http://issues.jboss.org has been upgraded this week to JIRA 5 and GreenHopper 5.10.